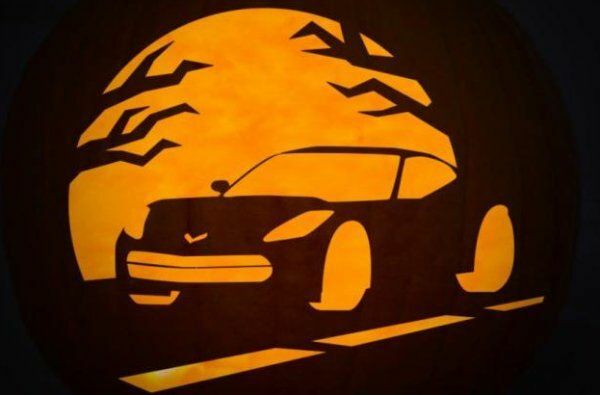 Tomorrow night, little kids around the United States will go door to door in search of free candy and those Chevrolet fans looking to show off their enthusiasm with their Halloween decorations can pick from a collection of 21 different pumpkin stencils available on the official Chevy FB page. Included in these stencils are the 2014 Corvette, the 2014 Camaro, the Volt and the Spark in “spooky” backgrounds along with Chevy bowtie emblems accompanied by the Cruze, Sonic, Volt, Camaro and Silverado script logos. There is also a trio of Corvette Stingray emblem options with both the Stingray logo and the Corvette crossed flags logo so the many Corvette fans around the US will be especially pleased to see so many ways to express their enthusiasm via a carved pumpkin. It should be noted that while these Chevrolet pumpkin carving stencils are very cool looking and free – the many fine details found in the majority of these images will make carving this logo into a pumpkin very difficult. Particularly the Corvette Stingray stencils and those choices depicting a grille with the Chevy logo have a ton of very fine lines that will be challenging to novice pumpkin carvers. Several of the stencils also include “shaded” areas that appear to be portions that you would carve down into the skin of the pumpkin without actually cutting all of the way through and, along with the thin lines, those shading techniques can be tricky. However, those Chevy lovers who have the patience and a steady enough hand to execute the many precision cuts needed to transform the fact of a pumpkin into their favorite car, the rewards are plentiful. While having a nicely carved jack o lantern with a traditional spooky face is cool, those run of the mill faces don’t catch the eye – or stick in the memory – like seeing a pumpkin sporting the next generation Corvette. Those Chevy fans who are interested in trying to carve the Corvette, Camaro, Volt, Spark or any of the other designs into their pumpkin may want to look into acquiring a pumpkin carving kit that includes small, super accurate tools that all allow you to make finer cuts than your average kitchen knife. You can check out the full list of Chevy pumpkin stencils here.